The cultural tradition of funeral services, among many African- American citizens, has been a unique tradition since slavery. Oral history tells us that during slavery times many slaves were not allowed the opportunity to have a funeral or to pay respect to the deceased. The deceased if fallen dead in the field, for instance was taken, wrapped and a hole was dug, with no funeral or burial rites. The only person to view this process was the digger of the hole. This was not always the case in many other instances of deceased slaves. Williamson County, Tennessee is known for its slave cemeteries, meaning that some slave owners had the decency to see that their slaves had a proper burial; and that loved ones were allowed to attend the burial. The history of some African American funerals, carry a uniqueness that often interprets the region of habitation. Thelma Battle’s 2018 Black History Month Exhibit, Lest We Forget, will be open the entire month of February during regular Library hours: M-Th 9 a.m. to 8 p.m., F-Sat. 9 a.m. to 5:30 p.m., and Sundays, 1-5:30 p.m. The cultural tradition of African Americans providing printed funeral programs at the ceremony of a loved one is a unique, yet national among most African Americans. History tells us that slaves were sold and many slave families were separated forever. This cruel act meant such slaves would never see their loved ones again or have knowledge of who they were. Today the ability to put in writing the life and times concerning the deceased and sharing it with family, friends and loved ones is an expression of freedom. It is a reminder as well as a celebration of “Who You Were” and “Whence You Came”, What You Stood For”. The order of service, the undertaker, flower girls and pallbearer and cemetery is also announced. Today many African Americans come together at funerals bearing an oppressed history, but are able to share in the freedom of this day and time; and in doing this act take home a keepsake printed history of the deceased. Such material is often priceless to genealogists tracing family trees. 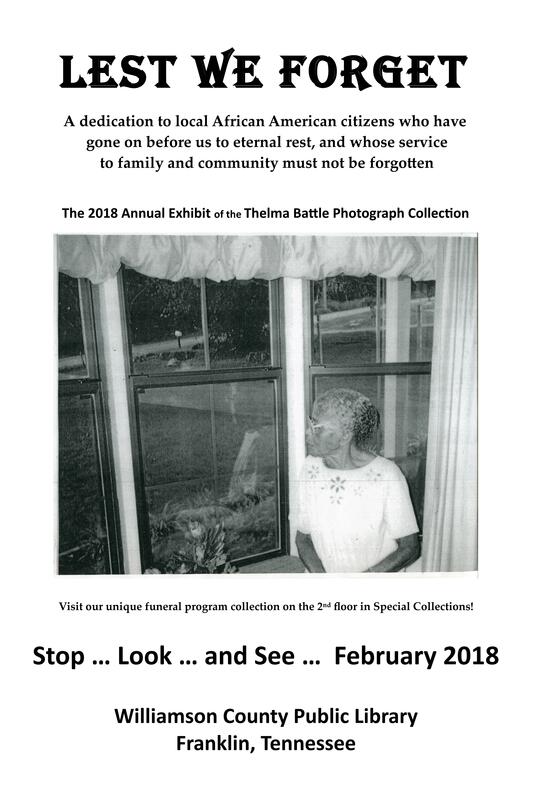 Posted on February 9, 2018, in Events, Library Services, Special Collections and tagged African American history, guest post, Lest We Forget, Thelma Battle, Thelma Battle Annual Exhibit, Williamson County African American history. Bookmark the permalink. Leave a comment.